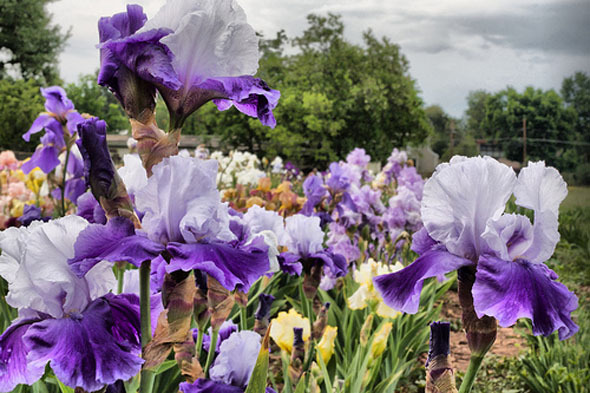 Not a traditional garden, Long’s Iris Gardens in Boulder is an urban agricultural business specializing in dig-your-own bearded iris. Visitors, whether they buy or not, are welcome to wander and enjoy the beautiful blooms during their peak in May and June. Like many tubucular patients of his time, J.D. Long headed west in 1898 in search of a climate drier than his native Iowa. He bought a downtown variety store with a seed department. In 1916 he bought a track of land on what was then the edge of Boulder to expand his seed-selling business. The city has grown up around the garden but Long’s granddaughters, Catherine and Margaret, and Catherine’s husband Dennis are determined to maintain it’s agricultural use selling drought-resistant iris. The site is now also home to a goat farm selling milk and cheese, to community gardens and to a program where children learn about agriculture and raise crops of their own. In addition to the flowers, the farm offers an insight into history. Tractors purchased in the 1940’s and 1950’s are still in use and the farm’s offices are in the old seed store, lined with hundreds of glass jars of seeds and sag-bottomed chairs where oldtimers talked weather and water. The dates for visiting vary with the weather (see the website), generally all of May and the early part of June. The commercial side is open from 9 a.m. to 5 p.m. seven days a week. Visitors can come after those hours but the Longs ask for a call in advance. Group tours are also available with prior arrangement.